our shop. We'll take a look and advise free of charge. We're a local business with over thirty of experience. We're located just behind Three Sheets Tap House in Dublin. Call for an appointment. Contact us for an appointment. Do I need a tow truck? You may not need to fire your rescue flares quite yet, but you should get it checked out soon. It can be anything from a loose gas cap to a smaller problem. The big problem is that these smaller things can build into huge problems. That's why it's a good idea to get it checked out. Plus, your car or truck will not pass a smog check when a check engine light is showing! A check engine light is one of the main causes of failed smog checks. When the check engine light is on, it could mean that your car is polluting our precious California air or getting poor fuel economy. California wants to protect the environment and save you money on gas. This is why it's important to have your check engine light checked out before your smog check. We've got the experience to help you with that. But you must have your check engine light pre-tested before your smog check. We are ASE certified. We love what we do. We've been doing it for years. We can offer you free advise on your check engine light, and we can likely help you fix the problem. 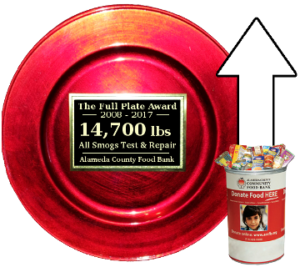 We are also active in the community and support the Alameda County Community Food Bank.